“I manage 2700 acres along with our family farm of 700 acres in central Victoria. Been using Rams bred by Graham Coddington for 35 years and have always followed his breeding strategies keep up with present market trends and breeding sheep for high profit per head with less inputs in management easy care lambing percentage still increasing this year. 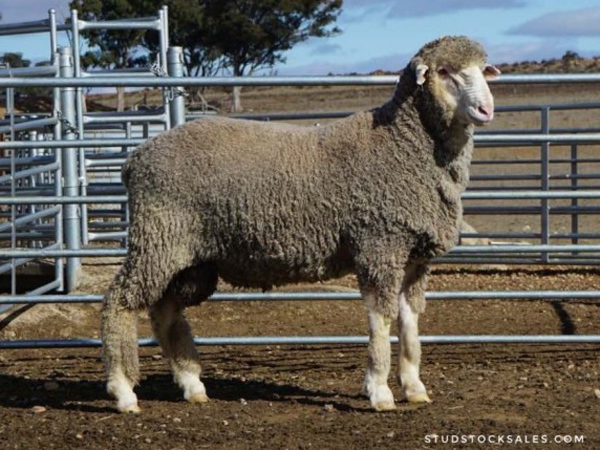 131% merino marking 120% one twin mob; cull ewes joined with white Suffolk marked 183% joining, over 3,000 ewes annually. 2018 Coddington Uardry blood lambs of mine not grain fed six to seven months of age Avg. 21.9kg equals $150 clear; 17.5micron wool off these lambs 5.5 months old 69mm in length sold for 1470 cents per kg in February 2018 to Italian spinners. Last year kept lambs longer avg 28kg sold for $192 per head. 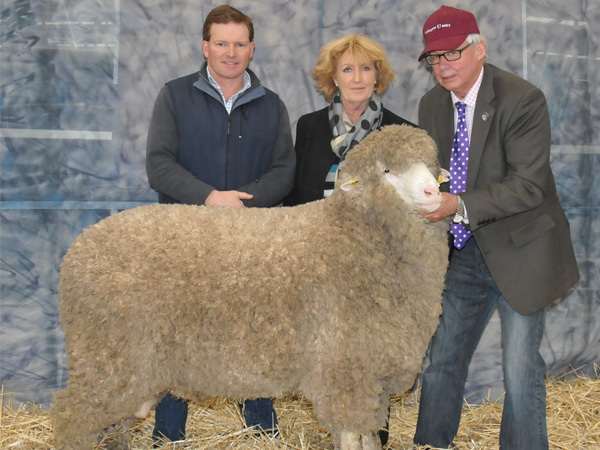 “The $11,000 Coddington Uardry Poll that sold at Classic ’16 to Calcookara has left progeny that are hard to find in this state-true New England-like white wools with aligned crimp and lustre yet on high trait, meaty carcasses. Keep an eye on these stud people!” end of quote. 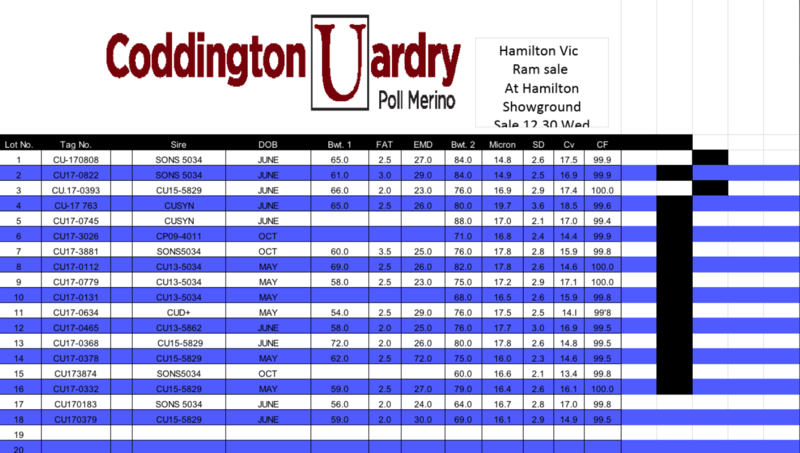 June wool sale at 10 months growth adult ewes 18.6 micron average wool cut, two tooth Ewes 17.6 micron 5.5kg; 1760 cents, 100 bales avg $3400.00 per bale wool style, staple length and softness improve, shearers say ewes too big fertility increased lambs marking merino 110% Suffolk over CFA ewes 132% wether lambs sold to meat trade. 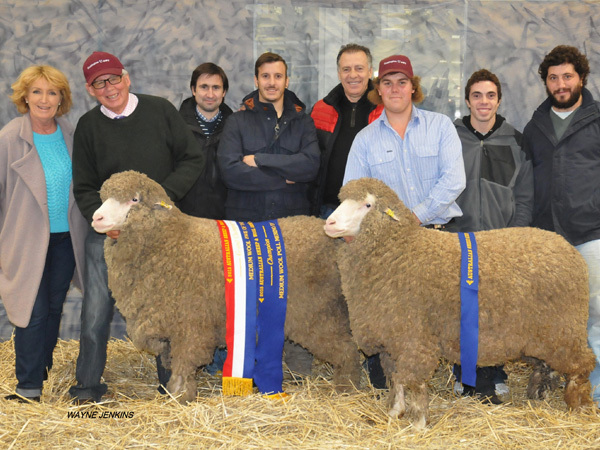 Long time client for 30 years change to Dohne 2003 now using Coddington Uardry meat family rams whole drop of wether lambs 330 sold over the hook to Southern meats May 2017. Average dressed weight 32.5kg at $5.80 per kg cut 3.5kg of wool sold 1200 cut per kg. Been a total of $230.00 per head on current prices August 2018 would make $299 per head.